Vikram's Son Dhruv Makes His Acting Debut! 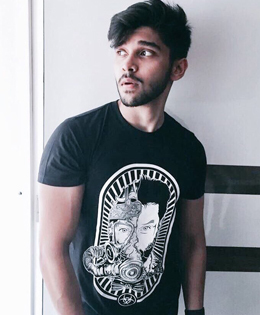 Actor Chiyan Vikram’s son Dhruv is all set to make his acting debut in the Tamil remake of the highly successful Telugu film Arjun Reddy. Chiyaan Vikram's son Dhruva has been making preparations to make his debut in films for the last few years and he has finally found the right script to kickstart his career in Kollywood. And on Sunday, Vikram officially announced that his son will make his acting debut with the Tamil remake of Telugu blockbuster Arjun Reddy. “Ready to make the leap. #DhruvtobeArjunReddy #E4Entertainment,” Vikram captioned a small video of Dhruv while sharing it on his Instagram account. Dhruva will reprise Vijay Devarakonda's role in the remake, to be produced by E4 Entertainment. Producer Mukesh Mehta wrote on his Facebook page: "We are extremely happy to share that Dhruva Vikram will be essaying the lead in the Tamil version of Arjun Reddy. We are honoured by the opportunity and confidence shown in us by Vikram and we will work towards making it a memorable launch."